As the (saw)dust begins to clear, you may have noticed that Third Place Commons has been looking a little shinier lately, and that’s thanks to the hard work of a whole lot of great folks who came together to make it happen. The work to freshen up the Commons was initiated by the “Renew the Space” subcommittee of the Third Place Commons Board of Directors after the board identified this work as a priority for 2017. “We felt that it was important to refresh our spaces in the Commons to better serve our community and provide a more welcoming environment,” explains Norman Lieberman, who chairs both the Board and the Renew the Space Committee. After doing a full inventory of the space, furniture, and community needs, the committee assembled a priority checklist of projects to tackle. First up was the Stadler Room, a meeting room named after founding board member Anne Stadler, who spearheaded the creation of our nonprofit organization nearly 20 years ago to foster community and host events that bring people together. The room was refreshed with a new, bright coat of paint that will allow more flexible use of the space since the light walls will allow users to use them for projection during meetings. The old floor tiles, which were hard worn after decades of moving tables and chairs back and forth, were replaced with modern carpet tiles for visual interest and sound dampening. Next up were the much-loved, large, wooden tables that sit at the heart of the Commons. Long a favorite gathering spot of artists, gamers, students, dancers, local community groups, and everyone else, the tables had accumulated a decade-plus of wear and tear on their tops. So earlier this month, they were removed to a nearby space where years of heavy use were sanded down and replaced with a shiny, new finish that’s ready for many more years of love. Of course, all of this work wouldn’t have happened without the commitment of many wonderful volunteers, as well as a very generous helping of guidance and expertise from the folks at Ace Town Center Hardware. 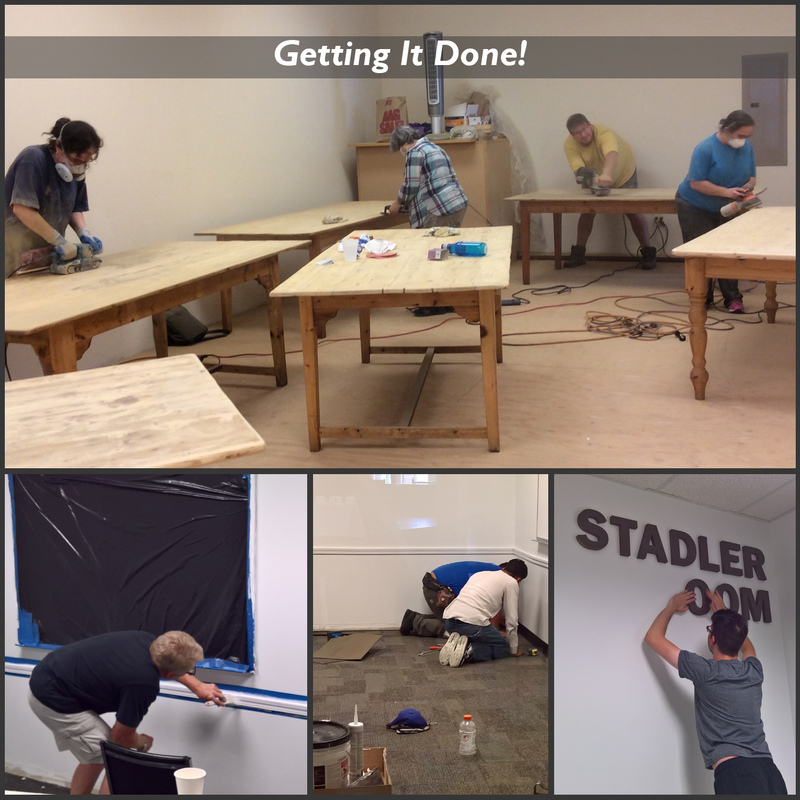 Big thanks go to the board and staff of Third Place Commons who all chipped in time and effort over a long weekend to prep and paint the Stadler Room before the new flooring was installed. 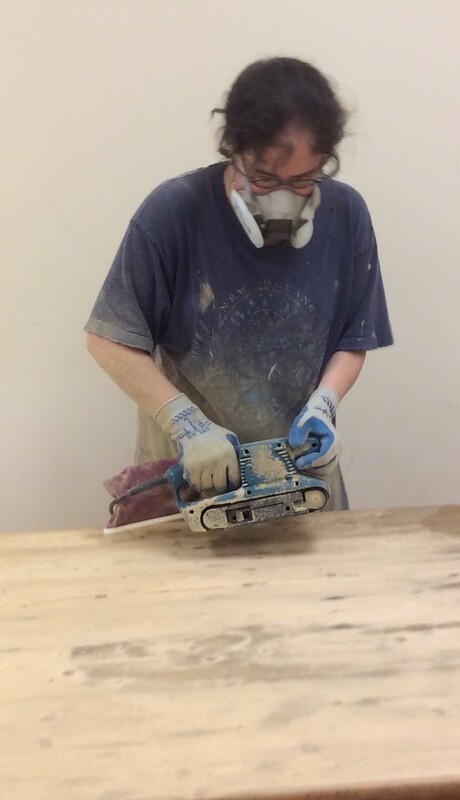 For the table refinishing job, it was community member Elsa Bouman who partnered with the Commons to spearhead the project. Through Elsa’s dedicated leadership, an amazing volunteer team – including Jason Colberg, Susan Jones, Shasta Miller, Sylvia Portillo, and Lisa Valore – assembled to give of their time and serious sweat equity to make the tables new again! Still ahead, Commons staff will be painting the stage floor and getting new carpet as well (hard floors for dancing and carpet for music), then replacing the outdated brown front-of-stage proscenium curtains with sleek, new, black ones. 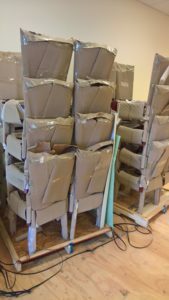 We’ll also be getting some new stacking chairs soon to supplement the regular Stadler Room chairs for larger meetings and events. Meanwhile, mall owners Merlone Geier Partners are contributing to the effort as well. Not only did they donate the storefront space that we used to refinish the tables, but they’re also bringing in some new chairs for the Commons that will help update the space and increase seating capacity for the very busy gathering spot. Ultimately, of course, this is all in service of you, our Commons Community. In the end, we hope the results will make the Commons an even better place to meet, celebrate, dance, create, and socialize for old and new friends alike. Third Place Commons is a community-supported, 501(c)3 nonprofit organization dedicated to creating real community in real space. It is located at 17171 Bothell Way NE in Lake Forest Park Town Center.